Congress President Rahul Gandhi says in his party’s manifesto for the 2019 elections: "I've never broken a promise that I've made." A textual analysis of the manifesto shows Gandhi and his party have a long list of promises to keep. The words "Congress promises" appear the most — 195 times — in the party's manifesto. The word "promises" alone (without 'Congress' accompanying in the phrase) appears 207 times. By comparison, the word had appeared only three times in the Congress' 2014 manifesto. The word "promise" (in the singular form) has been used 24 times in the 2019 document, against only four in 2014. Looking at the frequency of the two words without context, however, might not paint an accurate picture. Content analysis and text mining using software reveal that the Grand Old Party has made at least an estimated 226 pledges to deliver on/do something — big or small — clearly outlined as a policy or just stated as an intention. 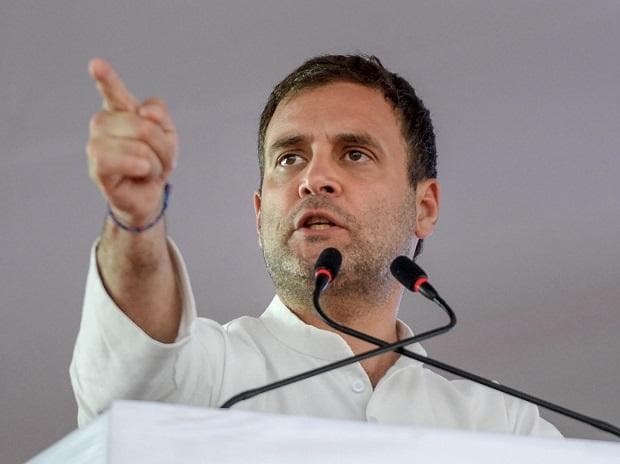 The Congress' promises seem to challenge the ruling Bharatiya Janata Party’s (BJP's) focus on national security after the Pulwama terrorist attack and the Balakot air strike. If voted to power, the Congress has said it would introduce a minimum income guarantee scheme, called Nyuntam Aay Yojana (NYAY), under which Rs 72,000 a year would be transferred to the poorest 20 per cent households in the country. NYAY is supposed to be the game-changer for the party. An analysis of keywords and phrases shows the issues the manifesto mentions the most. Focusing only on high-frequency keywords that relate to political issues, policy-making or a specific demographic revealed the issues Congress' 2019 manifesto mentioned the most, ranked from one to ten: 1. Education (51 mentions), 2. security (46), 3. rights (39), women (39), 4. institutions (31), 5. tax (30), 6. farmers (29), growth (29), 7. economy (28), healthcare (28), 8. jobs (27), water (27), 9. GST (23), and 10. infrastructure (22). At least 35 instances where the word "security" has been used are related to defending the nation from internal and external threats, securing its borders, the armed forces, defence strategy & production, and Jammu & Kashmir. The rest of the instances were related to food and social security. Almost all instances where the word "growth" has been used are related to the economy and industry. The 2019 manifesto's most used relevant phrases, ranked from one to five, were: 1. Armed forces (17 mentions), 2. persons with disabilities (12), 3. civil society (11), colleges and universities (11), national security (11), police forces (11), public sector (11), 4. foreign policy (10), goods and services (10), panchayats and municipalities (10), and 5. senior citizens (9). At least three instances where the phrase "goods and services" have been used are related to the Congress' promised changes to the Goods and Services Tax (GST) regime. Other high-frequency phrases include Jammu and Kashmir (8), North Eastern (8), scheduled tribes (8), school education (8), and climate change (7). "NYAY" is the Congress' solution to "eliminate abject poverty by 2030". The word finds six mentions. The word "poor" come six times, "poorest" four, and "poverty" 15 times in the 2019 manifesto. Only in four of the instances where the term "poor" has been used is it related to economic poverty, though. Clearly, the biggest promise made by the party is not related to the most used words or phrases in the manifesto. However, the total NYAY-related words' tally stands at 29. The Congress also appears to have been mindful of the importance of national security as a poll plank. Apart from the number of times the word "security" has been used, "armed forces" is the fifth most frequent phrase, used 17 times, in the 2019 document. With a frequency of 11, "national security" is the seventh most used phrase, along with "police forces". The phrase "internal security" has been used 6 times and "border security" 4 times. Congress has promised to reverse what it has described as the trend of declining defence spending under the National Democratic Alliance government, and increase it to meet the requirements of the armed forces. It has also said it will expedite all defence modernisation programmes in a transparent manner. Apart from mentioning the word "farmers" 29 times in the 2019 manifesto, the Congress has used the words "agriculture" 19 times and "farm" 7 times. Taking the total farmer-related words' tally to 55. The phrase "farm loans" has also been used once. Congress has promised to put farmers on the path from "Karz Maafi" (debt forgiveness), to "Karz Mukti" (freedom from debt); ensure remunerative prices, lower input costs, and assured access to institutional credit; present a separate "Kisan Budget" every year; establish a permanent National Commission on Agricultural Development and Planning. Along with mentioning "jobs" 27 times, the Congress manifesto has used the word "employment" 19 and "unemployment" 5 times. Thus, the total job-related words' tally stands at 51. The Congress has promised to make jobs its first priority, should it come to power. It promises to fill all 400,000 central government vacancies before March 2020, persuade state governments to fill their 2 million vacancies, create an estimated 1 million new Seva Mitra positions in every gram panchayat and urban local body, reward businesses for job creation and employing more women, require businesses with over 100 employees to implement an apprenticeship programme. The word "secular" is entirely missing from the Congress' 2019 manifesto. The word had been used 4 times in the 2014 document to burnish the party's liberal credentials and to draw a contrast with what it described as the BJP's "narrow-minded communalism" and "divisive authoritarianism".